Gastro-Intestinal Low Fat is a complete dietetic feed for the nutritional management of dogs formulated to regulate lipid metabolism in the case of hyperlipidaemia. This food contains a low level of fat and a high level of essential fatty acids. Digestive security - nutrients which support a balanced digestive system. Low Fat - for the nutritional management of dogs with digestive disorders in need of a low fat diet. Fibre Balance - adjusted levels of soluble/insoluble fibres to help limit fermentations and promote good stools quality. Antioxidant complex - a patented synergistic complex of antioxidants to help neutralise free radicals. COMPOSITION: meat and animal derivatives, cereals, derivatives of vegetable origin, minerals, oils and fats, yeasts. ADDITIVES (per kg): Nutritional additives: Vitamin D3: 200 IU, E1 (Iron): 8 mg, E2 (Iodine): 0.15 mg, E4 (Copper): 1 mg, E5 (Manganese): 2.5 mg, E6 (Zinc): 24 mg - Technological additives: Pentasodium triphosphate: 1 g.
ANALYTICAL CONSTITUENTS: Protein: 7.5% - Fat content: 1.7% - Crude ash: 1.5% - Crude fibre: 1.7% - Moisture: 74% - Essential fatty acids: 0.3% including Omega 3: 0.03%. 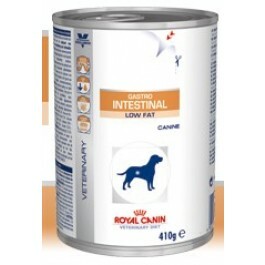 Royal Canin Gastro Intestinal Low Fat should be recommended by your veterinary surgeon. For detailed information on feeding amounts and how this food can help your pet, please consult your veterinary surgeon.